This is the same authentic Bulgarian heirloom yogurt starter only with added oil extract from the famous Bulgarian rose damascena. 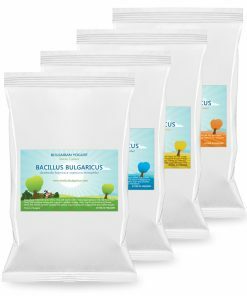 It makes genuine Bulgarian yogurt (kiselo mlyako) of exceptional quality with classic Bulgarian yogurt taste, thickness, acidity and aroma with just a touch of rose flavor. Select a pack size and enjoy! This is the same authentic Bulgarian heirloom yogurt starter only with added oil extract from the famous Bulgarian rose damascena, the Queen of roses. 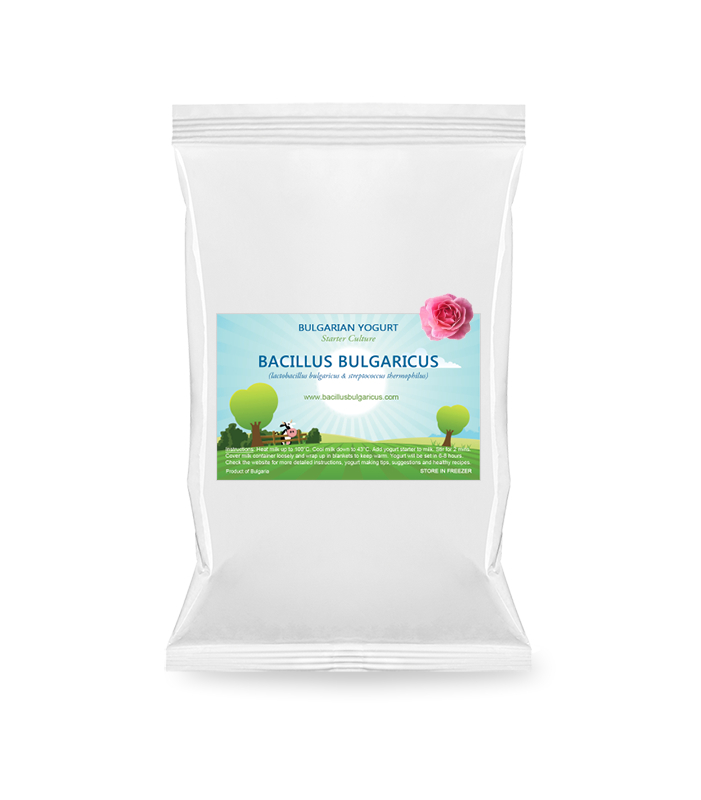 Each pack contains loose powder mix, in perfect proportions, of the two strains required to make Bulgarian yogurt — lactobacillus bulgaricus and streptococcus thermophilus — as well as rose damascena oil extract to make the same thick, creamy and absolutely delicious yogurt with just a touch of rose flavor and all the health benefits of rose damascena. Ingredients: Live active lactic acid cultures (lactobacillus bulgaricus and streptococcus thermophilus), rose damascena oil extract. Thanks for getting the yoghurt starters to me so quickly. I should say too, how delighted I am with the flavour of your yoghurt. I thank you for introducing me to this rose starter. Not being a fan of yogurt but need to eat it this has made for a nice surprise. I’m learning to like it much better. I’ve been making it for a few years now and your’s is the best starter by far and a little makes a nice batch. Thanks again! Hi Ivo. They are delicious ! Tried the Rose this morning…so creamy, so tart, thick. Loved it. We make over two gallons yogurt weekly, so I’ll be ordering more when my starter gets weak. No problem with the starter, in fact I ordered a new batch of Rose Starter a few weeks ago. I have a Lakeland I litre yogurt maker, so temperature is governed by the unit. The milk is first boiled to 100 degrees Centigrade measured with a jam thermometer and then cooled to 40 degrees before stirring in the starter and then placing milk into pre heated Lakeland unit. Process time allowed 8 hours. The same process produces lovely yogurt using the rose starter. The rose yogurt starter is very much to my taste and will shortly order some more. I like both products — rose and plain — as I was raised with Japanese yogurt using Bulgarian culture. We really love the Rose flavor starter! 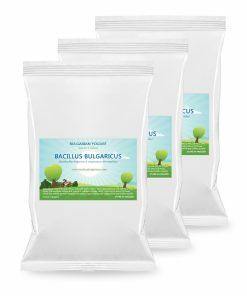 I use a gallon of 2% milk, heat it to between 180°F and 212°F then cool down to 110°F and add 1/2 teaspoon of Bacillus Bulgaricus yogurt starter. Then I pour the milk/starter into 4 wide mouth 1-quart ball jars and put on plastic lids with silicone seals. I then place the jars into a small well insulated cooler like a Yeti or RTIC then fill with hot water up to just below the lids and leave overnight. My hot water is set to 115 F.
In the morning I have perfect yogurt that I place into the refrigerator. The 2 litres of the rose flavour turned out well !